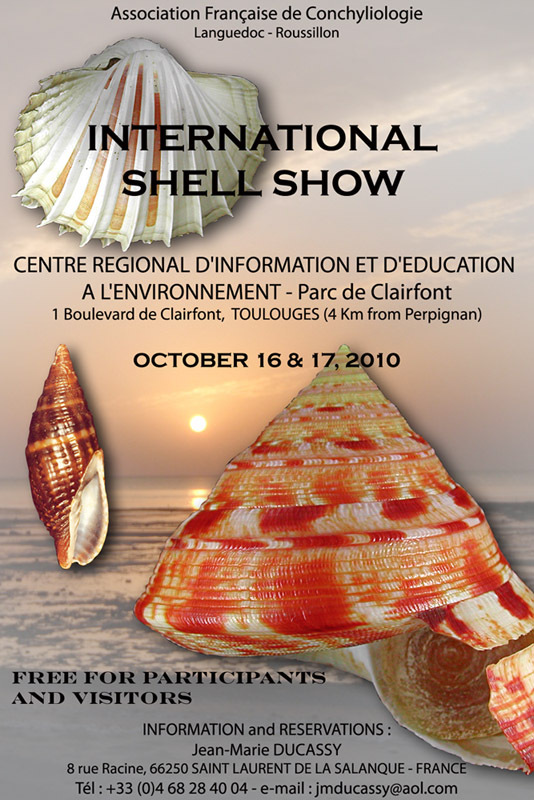 Forums SEASHELL-COLLECTOR - The Toulouges / Perpignan International Shell Show is in one month! Forums SEASHELL-COLLECTOR > Seashell Collector's Forum > Worldwide Shell Shows > The Toulouges / Perpignan International Shell Show is in one month! Full Version: The Toulouges / Perpignan International Shell Show is in one month! The Toulouges / Perpignan International Shell Show is in one month! The show will be hosted by the Centre RÃƒÂƒÃ‚Â©gional d'Information de d'ÃƒÂƒÃ¢Â€Â°ducation ÃƒÂƒÃ‚Â l'Environnement (CRIEE), 1 boulevard de Clairfont in Toulouges (4 km from Perpignan) in South of France and organized by the Association FranÃƒÂƒÃ‚Â§aise de Conchyliologie. Being so close from the Spanish border, we hope to use this opportunity to create new links in between shell lovers both sides, including Portugal. It will be open to the public on Saturday October 16 and on Sunday October 17 from 9:00 Â to 7:00 pm. Some space is still available for exhibits. We would be specially pleased to welcome more exhibitions or shell dealers specialized in Mediterranean or land / freshwater shells. No fees are requested for tables as we are in our own structure and the shell show is free for visitors as well as for participants. It might be also an opportunity to discover the collections of the CRIEE (in particular 7 600 Conidae) or its library. Do not hesitate to share the info, or to contact me for further details.